ÍF made a perfect start to their European debut when they took the lead in the 8th minute after well placed header from Dánjal á Lakjuni from the edge of the penalty area. The Icelandic visitors nearly levelled after 15 minutes, but the post and a terrific one-handed save from goalkeeper Jákup Mikkelsen kept the header out. But six minutes later Mikkelsen was beaten when Kjartan Finnbogason received the ball a few metres outside the penalty area, turned and fired a powerful shot into the back of the net, just inside the right post. After KR had dominated before the goal, the match evened out as ÍF tried to get more forward again, but just before the half-hour mark, KR took the lead with a deflected shout that deceived Mikkelsen. ÍF were close with an equalizer shortly before half time when Bogi Løkin’s volley became a perfect pass to Bartal Eliasen who headed across the face of goal from a free header. Eliasen usually don´t miss such an opportunity. Although KR weren’t creating a bunch of scoring opportunities in the second half, they were generally the better team while ÍF struggled to create anything up front. Baldur Sigurðsson was clear on goal for KR midway through the half, but Mikkelsen denied the Icelandic. But with 12 minutes remaining, Mikkelsen could do nothing when an unmarked Sigurðsson headed home from close range from a corner. Overall, KR had been the better team, but as a whole created few chances, but got much out of little. Instead of ÍF, who are second from bottom in the table, it would have been interesting to have seen one of the top teams from the Faroese League to have taken on the current Icelandic table toppers. As a curiosity, it could be mentioned that KR was the first Icelandic football club to ever visit the Faroe Islands. That happened in 1939 when they played against TB Tvøroyri. The result of the first match was the same as today: 3-1 for KR. 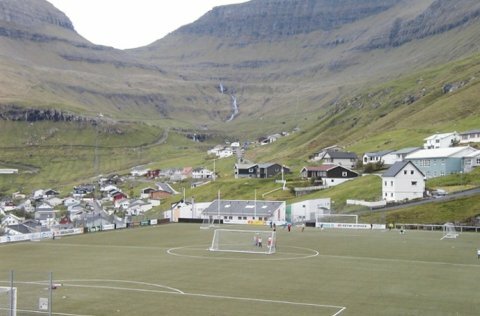 ÍF Fuglafjørður's normal football ground, í Fløtugerði above. As it's not up to UEFA club competition specifications, ÍF had chosen Gundadalur Stadium in Tórshavn as their venue. NSÍ escaped London with a respectable 3-0 defeat against Fulham where NSÍ managed to hold tight for more than half an hour until Damien Duff finally broke the deadlock in the 33rd minute after he was set up by Simon Davies who had combined well with Bobby Zamora. NSÍ goalkeeper Andras Gango did well to keep Zamora’s free kick out just before half time, as he tipped the ball over the crossbar to go for tea with just one goal in deficit. Just after the hour-mark Fulham were awarded a penalty as Helgi L. Petersen brought down Simon Davies in the area. Danny Murphy safely converted from the spot to make it 2-0. It became 3-0 ten minutes later with a low shot from Andrew Johnson. Gango then had several fine saves to keep the score-line respectable as he saved from Zamora who also hit the woodwork, and later pushed Johnson’s effort onto the crossbar. Just under 15,000 people attended the match at Craven Cottage so see the amateurs from the Faroe Islands against the professionals from the Premier League. Fulham’s new manager Martin Jol had taken no risks and had fielded his strongest team. NSÍ had been hampered because two of their foreign midfielders, Abdul Razak Ismail and Mamuka Toronjadze, had not been granted entry permit into England. Also Faroese international Einar Hansen missed the game. The second leg will be played at Svangaskarð Stadium in Toftir on 7 July. The Icelandic title aspirants, currently 2nd in the table with a game in hand, dominated the match from start to finish and were 2-0 up at half time, with two goals in quick succession midway through the half. Óskar Örn Hauksson released Kjartan Henry Finnbogason who set up Guðjón Baldvinsson for an easy finish for 1-0, although he nearly made a meal of the situation as he almost fell in the action. Five minutes later it was 2-0 when Finnbogason again had the assist; this time for Bjørn Jónsson to score from within the penalty area in his debut for KR. Within two minutes from the restart, Finnbogason this time was the scorer himself, as he made it 3-0 for the home team with a rebound from his own header on the post from a free kick. The one-way traffic continued, and 10 minutes later Baldvinsson scored his second goal of the evening with a graceful lob over ÍF goalkeeper Jákup Mikkelsen. A few minutes after KR had hit the upright twice, ÍF scored a late consolation goal through Nenand Saric. But KR were not finished yet as Baldvinsson set up Hauksson who finished coolly to rub salt in ÍF's wounds in the 90th minute. With 5-1 on the night and 8-2 on aggregate, KR now face MŠK Žilina from Slovakina in the second qualifying round. Fulham started strongly, with Damien Duff hitting the crossbar inside the first 4 minutes, and in the next three, it was NSÍ’s Hungarian goalkeeper Andras Gango who kept the visitors at bay with a couple of crucial saves. NSÍ rode their luck a couple of times during the first half as Fulham chances went begging, but overall NSÍ were well organized and managed to hold Fulham from scoring in the first half. The second half followed a similar pattern, where NSÍ worked hard defensively, and had lady luck on their side a couple of times in addition to saves from their goalkeeper. Half an hour into the second half NSÍ had a great opportunity to take the lead as striker Klæmint Olsen was played clear on goal, but his diagonal shot went wide of the post. Fulham had again fielded close to their strongest team, although 4 changes had been made from the first leg. Video highlights NSÍ Runavík - Fulham F.C. EB/Streymur snatched a draw in the third minute of added time to make the long journey to the return leg in Azerbaijan much more pleasant. - Hopefully the trip back home will be even more pleasant, but the pattern is that Faroese clubs find it very difficult to cope with the heat in Eastern Europe. Anyway, in today’s match Qarabağ took the lead after 10 minutes when they entered the penalty area and a tackle had an unlucky bounce straight to the clear Rauf Aliyev for a simple finish. But before that, Hans Pauli Samuelsen had been extremely close for an opening goal to EB/Streymur with a shot following a long throw-in. Although the visitors had a clear majority of possession and also created a couple of good scoring opportunities, EB/Streymur were not out of it and had three attempts in succession just before the half-hour, where Hans Pauli Samuelsen’s effort was cleared off the line. The second half followed a similar pattern of the first half and when 90 minutes had gone, it looked like a narrow win for the visitors. However, almost three minutes into added time, Arnbjørn Hansen popped up to sweep a rebound from the post into the net for the equalizer following a long throw-in. The return leg is in Azerbaijan next Thursday. EB/Streymur have crashed out of the Europa League on away goals after a goalless draw away to Qarabag FK. But it is the closest a Faroese club has come to advancing to the third qualifying round of a European competition. The Azerbaijanis dominated proceedings for most of the match, but without creating too many clear-cut scoring opportunities, however. But it nearly went wrong for EB/Streymur a couple of minutes after the break when a Qarabag player got clear in centre of goal, but from close range the finish was straight on goalkeeper René Tórgarð. Four minutes from the end of normal time Qarabag went close again, but the attempt from the left, just outside the goal area, went wide of the far post. In added time Arnar Dam so nearly snatched what would have been a sensational victory for EB/Streymur after their only real attempt on goal after a long throw-in from Gert Hansen, but Dam was just centimetres from connecting properly with the ball inside the goal area.